Jim Yong Kim, an American who is president of Dartmouth College, has been chosen to be the next president of the World Bank. His selection extends the U.S. hold on the top job at the 187-nation development agency. Kim, a surprise nominee of President Barack Obama, was selected Monday in a vote by the World Bank’s 25-member executive board. He’ll succeed Robert Zoellick, who’s stepping down after a five year term. Kim’s selection marks a break from previous World Bank leaders who were typically political, legal or economic figures. The World Bank raises money from its member nations and borrows from investors to provide low-cost loans to developing countries. Treasury Secretary Timothy Geithner praised the selection, saying Kim "has a lifetime of experience solving complex problems." He said Kim "will help breathe new life into the World Bank’s efforts" to promote economic growth around the world. Developing countries had put forward two candidates for the post: Nigerian Finance Minister Ngozi Okonjo-Iweala and former Colombian Finance Minister Jose Antonio Ocampo. Both argued that it was time to break the hold the United States has had on the World Bank job and provide a greater voice for developing nations. On Friday, Ocampo announced that he was withdrawing and throwing his support to Okonjo-Iweala. The World Bank didn’t reveal the board’s vote. But it said "the final nominees received support from different member countries," – indicating that Kim’s selection was not unanimous. Oxfam, the global anti-poverty group, complained that the process was tainted by the fact that a U.S. candidate was again selected in a closed process. For nearly seven decades, the World Bank has always been led by an American, while the International Monetary Fund has always been led by a European. "Dr. Kim is an excellent choice for World Bank president and a true development hero," said Elizabeth Stuart, a spokeswoman for Oxfam. "But we’ll never know if he was the best candidate for the job because there was no true and fair competition. This sham process has damaged the institution and sullied Dr. Kim’s appointment." Kim issued a statement accepting the job from Lima, Peru, his last stop on a global tour that has taken him to Africa, Asia and Latin America to seek support from developing countries. He praised his two opponents from developing countries and said his goal as president would be to "seek a new alignment of the World Bank with a rapidly changing world." Kim will begin a five-year term in July. Born in South Korea, Kim is an American who moved to the United States with his family at age 5. His selection extends the tradition of Americans leading the World Bank dating to the institution’s founding in 1944. He and the other candidates were interviewed by the World Bank’s board last week. In his statement to the board, Kim said he had worked throughout his career for "reform and change" and would continue those efforts at the World Bank. Obama’s announcement March 23 that Kim would be the U.S. nominee for the World Bank post came as a surprise. His name had not been mentioned as a possible candidate. Since 2009, Kim has been president of Dartmouth College. But Kim’s nomination won widespread praise because of his extensive experience in working to improve health in the poorest countries. In the 1990s, Kim defied skeptics to find a cost-effective way to fight tuberculosis in the slums of South America. He also began a program that has treated millions of Africans for HIV, the virus that causes AIDS. Eswar Prasad, an economist at Cornell University and a former top official at the International Monetary Fund, said Kim’s medical background gave him vital experience in solving problems facing developing nations. The World Bank focuses on fighting poverty and promoting development. In recent decades, it’s focused on poor nations in Africa, Asia and Latin America. It is a leading source of development loans for financing to build dams, road and other projects. Dartmouth College has appointed Provost Carol Folt as interim president, a day after President Jim Yong Kim’s election to lead the World Bank. 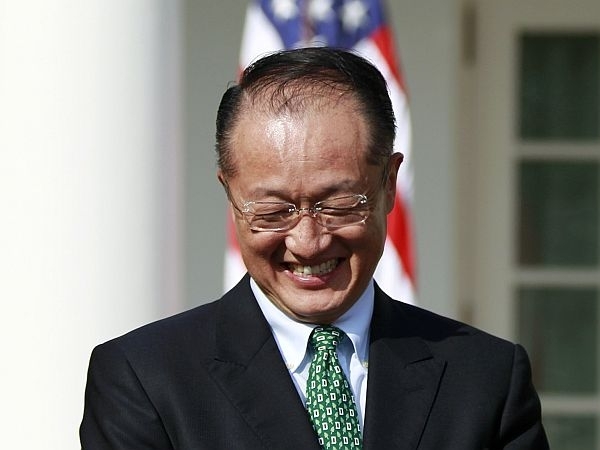 Dartmouth President Jim Yong Kim was interviewed by directors of the World Bank this week. Kim is President Obama’s nominee to be the next head of the global financial organization.